When we took our steer to the butcher, I asked for the fat to be included in our order. Most folks don't ask for the fat from their animals, but we brought home four big bags of suet to be turned into tallow. Four bags was more than I needed at the time, so I stuck the bags in the freezer and have processed them one by one as I needed tallow or had the time to deal with it. Winter is an excellent time to render tallow: the heat of the stove being on all day is quite welcome. I use tallow for cooking and to fry foods, especially french fries. Tallow contains a little less than 3% polyunsaturated fats, just a bit lower than coconut oil, and is much better for you than vegetable oils. Click here to subscribe to The Acorn, Oak Hill Homestead's weekly-ish newsletter and download a free copy of my ebook, How to Make Vinegar for Pennies. The other way I use tallow is in my handmade soap recipes. Tallow is an excellent fat to use in soap making; it's easily absorbed by the skin and is very nourishing. If you are going to purchase beef fat to render into tallow, be sure to look for grass-fed beef suet. There are several ways to render tallow, including in the Crock-Pot or slow-cooker, in the oven, and on the stove top. I like using the slow-cooker but I can't process as much tallow in it as I can in a large pot or stockpot. I personally don't like rendering it in the oven because I worry about spilling it when removing the baking dish of hot fat from the oven. I prefer using the stove top, so that's the method I'll show you today. 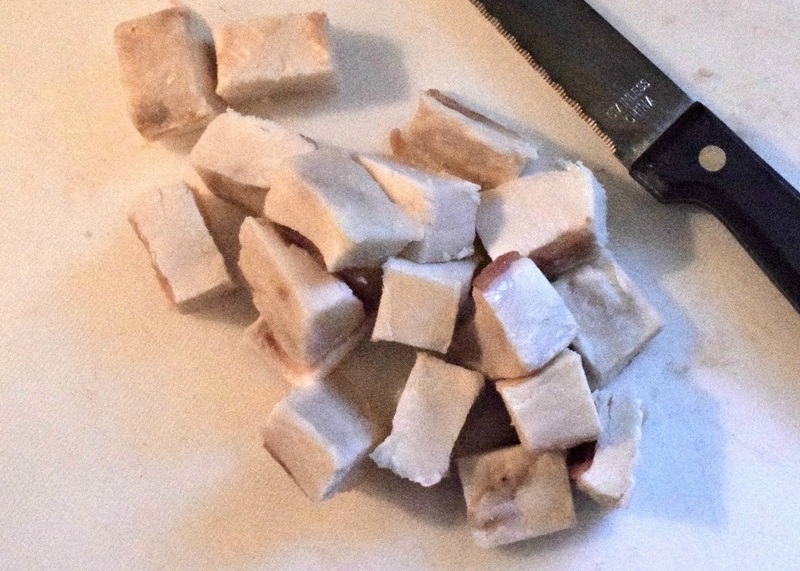 Start by cutting the large pieces of fat into small pieces (cubes that are about one-inch in size) so they will cook more quickly. Suet is easier to cut with a sharp knife if it's just slightly frozen, so let it thaw a bit first. Add the chopped fat to a large pot, then add enough water to cover it all. Bring it to a slow boil, then turn down the heat and let it simmer for several hours. This is sometimes called "wet rendering" because we've added water to the fat. I think this method produces cleaner tallow than dry rendering, where no water is added. How long does it take to render tallow? I wish I could tell you, but it depends on a lot of things such as how much suet you're rendering, how much water you put in the pot, the temperature of your stove and so on. Here's how you'll know when it's done, or at least close to being finished: the recognizable chunks of solid fat disappear and in its place will be golden yellow liquid fat. The color of your liquid tallow fat may vary. Sometimes mine is a darker, deeper gold, and sometimes it's a lighter, translucent yellow. When it's finished, pour the contents of the pot through a strainer and into containers. I like using glass bowls that can withstand the heat of the hot oil. Be careful while pouring: the hot liquid fat can burn you much worse than boiling water. Then put the containers in the refrigerator overnight to cool. If it's winter time, you can let them cool in an unheated mudroom, porch or garage instead, to save room in your refrigerator. Even if your batch of fat is a deeper color, it will harden to a lovely white when the tallow solidifies. When the tallow has cooled, you'll see that the fat has risen to the top of the container and become hard, leaving the water underneath. I usually leave it undisturbed overnight. Separate the thick layer of solid white fat from the water on the bottom of the container. I run a sharp knife around the edge of the container, then lift up the tallow in one piece. Give the underside of the fat layer a quick rinse with hot water to remove any impurities. NOTE: Be careful when you clean your pots and utensils. Hot fat poured down your drain will congeal and can stop up your plumbing. If you think your tallow needs to be a bit cleaner - sometimes it will smell of cooked meat, for instance, or the underside of the tallow disk will look a bit dirty - you can separate the solid fat from the water, add it back to the pot with fresh water, melt it and strain it again. It doesn't take long to redo it, just heat it long enough to melt the fat and then let it harden again in the refrigerator. 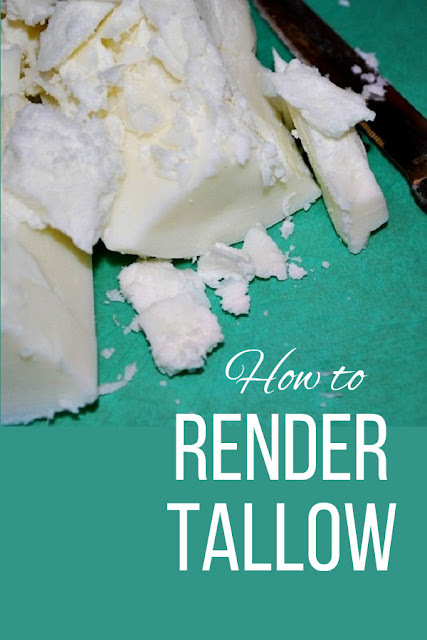 Put the rendered tallow in a freezer bag, label it, and store it in the freezer. Tallow will last nearly forever in the freezer. Or if you prefer, you can heat up the tallow again - without adding water - to a liquid state, pour the hot tallow into canning jars, add lids and let it cool, then store the tallow in a cool, dark place such as a basement. Label and date each container so the oldest ones are used first. I'm told that the jars of tallow can last up to a year, but I've never stored it this way. Lard is rendered in the same manner as tallow, by the way. How will you use those beautiful chunks of pure white tallow or lard? Thanks for the pin, glad I found you on this weeks blog hop hosted by The Green Acre Homestead. I've never done this before and hoping that I can apply your tips to rendering tallow from our Scottish Highland cattle when I start my next homesteading skill adventure at learning to make soap.